Welcome to the studio voted no. 1 in the valley. Ready to discover your Happy Place? We are a leading edge fitness studio that merges the features of an exercise facility with the spiritual luxe of a spa. Three ultraclean yoga rooms have been created for your practice. Our largest room is the Sun Room, a hot yoga room, which accommodates up to 50 people. 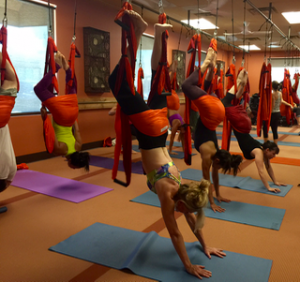 Our Moon Room, which is not a hot yoga room, holds up to 25. We also have a small private yoga and treatment room called The Cosmos. This is reserved for one-on-one interactions or small groups. Our rooms are designed in a rectangular configuration, offering maximum exposure to mirrors for self-modification as needed. This also creates more privacy in your yoga experience. 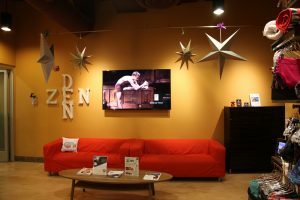 Our Zen Zone is our lobby/lounge area, comfortably designed for you to meet new friends or just relax. BYPCV hosts a full schedule offering the complete spectrum of classes. 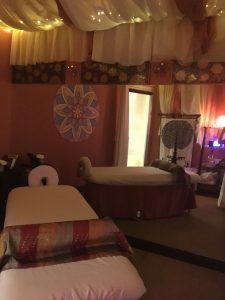 We cater to every level including traditional 90 Minute Hot Bikram Yoga, 60 Minute Hot Yoga, Yin Yoga, Vinyasa, Chair Yoga, Zone Yoga, Intro to Trapeze, Trapeze Yoga, and even Booty Barre and Pilates, Here, there truly is something for everybody. You’ll find our beautifully appointed men’s and women’s locker rooms are imbued with the luxurious ambience of a spa. Each locker room has three showers, ample changing areas and plenty of storage for your use. We offer mats and towels for rent at the studio as well as a thoughtfully merchandised boutique featuring the latest yoga wear and accessories. There is generous free parking. The exact conditions for Bikram Yoga: Bring on the heat. In our hot Sun Room, you’ll find every aspect of Bikram Yoga followed to the letter: room temperature set exactly to 105 degrees with 40 percent humidity and controlled, evenly distributed and consistent fresh air. Air flows continuously through a CO2 controller to create the ideal balance of oxygen and CO2. Further, the air is purified through a UV light filter that kills germs and bacteria. So you’ll breathe fresh, clean air throughout your class. Why does this matter? It ensures you receive Bikram’s prescribed conditions for your optimum performance. And, naturally, we want you to have it all. Pure air to fuel your yoga experience. 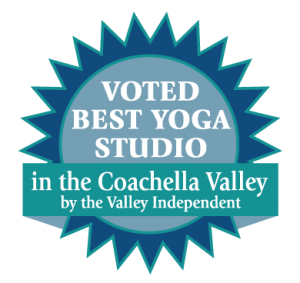 Exceptional air quality is a vital and life-enhancing part of our hot yoga program. To this end, we have invested in the latest leading edge technology: our heating and humidifying system uses advanced ultra violet light rays that disinfect every air molecule. It’s a tried-and-true system that ensures the purest, quality controlled fresh air for your yoga experience. Oxygen filled and germ free. Fresh, oxygen filled air is consistently pumped into each studio through an advanced design air system; the technology destroys virtually all harmful bacteria, producing the highest quality air possible. With our studios completely oxygenated, disinfected and humidified, you’re assured of breathing germ-free air. That’s why our air smells and feels so pure. Optimum humidity for a sublime workout. Our climate controlled humidity system compensates for the dry desert air. Let’s face it, today the air we breathe is permeated with a host of bacteria and chemicals. Breathing fresh, clean air that’s properly humidified during your workout protects you from pollutants, improves sinus conditions and breathing, minimizes the chance of catching a cold or worse, and so much more. Our system delivers the ideal, balanced humidity levels that produce a sublime and transporting workout. We spent years searching for the perfect hot yoga flooring and made a few mistakes along the way. Finally we found a company willing to make a yoga floor to our specifications, then we waited for months until it was manufactured in Europe. This firm padded rubber tatami textured flooring is slip resistant and water proof. That means you can sweat all you want on it and the floor does not absorb the sweat or the smells. We mop the floor after every class with fresh water, tea tree oil and alcohol to disinfect it and leave it germ free. The firm padding allows for easy balancing and feels great on knees and spines. juices and of course, water! that invites a community feel.